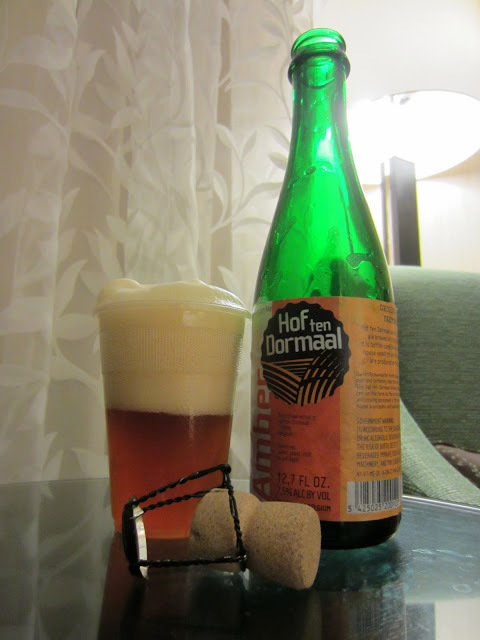 This amber saison from Hof ten Dormaal has a clouded unfiltered amber hue with a brilliant inner glow. Rapidly rising carbonation fuels the huge yellowed-tan head which features distinctive and chunky peaks and valleys of foam. The beer's head features superb retention and leaves massive swathes of lace behind. The nose is malty with a minor lagery aroma and a sweet honey-like character. The nose is vaguely like a German bock, or perhaps more closely, a mäibock. The body features prominently complex earthy tones and a broken down graininess that brings the character of this amber saison more in line with the flavor profile of a Belgium dubbel. Caramel and a dank woodiness hold up the lower end of flavors, which are matched by the sweetness of dark fruits like figs and dates. Spiciness comes in late with a minor dustiness. The beer doesn't seem much like a saison, but it is delicious.